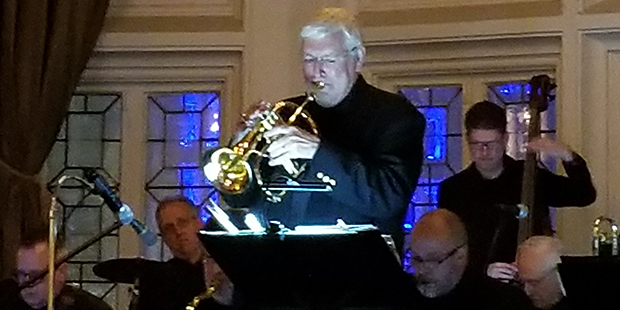 The JoySwing Jazz Orchestra brings an uplifting musical experience to churches and Christian organizations through unique presentations. Featuring instrumental and vocal big band music JoySwing performances are designed to provide an exciting musical experience. The listener’s life is enriched by the impact created when jazz meets the church. JoySwing includes twenty highly trained instrumentalists, vocalists, technicians and a musical director united in a ministry of Joy. A JoySwing sacred jazz concert features music of the swing and jazz styles incorporating traditional hymns and spirituals as well as arrangements of contemporary Christian songs with the unique sound of Big Band Jazz. JoySwing performs musical scores from award winning arrangers and composers.